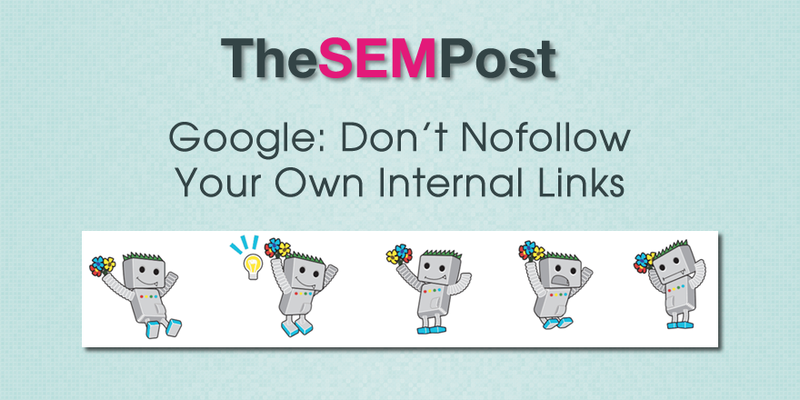 Are you nofollowing internal links on your site? If so, you might want to remove them unless you have a pretty good reason to be using it. Recently, nofollowing internal links gained traction as many webmasters who received a recent outbound link manual action decided to nofollow every link on their sites, including internal links as well. Gary Illyes, in yesterday’s keynote with Stone Temple said that sites shouldn’t nofollow their own internal links. Nofollow is probably never the answer, especially on your own site. I can think of corner case scenarios where the target page would be robotted for whatever reason, and then if it is robotted and not indexed yet, if you don’t want to get that page indexed, then you probably don’t want to point to it with anchors. John Mueller did say this previously, but in respect to the outbound link manual actions. Last month, when Google sent out a mass number of outbound link manual actions targeting bloggers who did paid reviews without disclosing or nofollowing the links, many bloggers simply nofollowed every link on their site… some who nofollowed their internal links too. And some people attempt to use nofollow either to prevent a page from being indexed (you are best to block the from robots.txt prior to publishing or place a noindex on it if Google has indexed it first). And lastly, some use in in an attempt to influence crawl budget or for PageRank sculpting. Thanks for highlighting this important tip from our Virtual Keynote with Gary, Jennifer. Just to add one thing to the final remark, about trying to use nofollow for PageRank sculpting, Eric Enge clarified with Gary that the PageRank (and any other authority signal not passed by the no-followed link is NOT redistributed to the other links on the page. This is very timely for me – I’ve been trying to get John Mueller to reply re: this topic via Twitter for the last couple weeks without success – my focus is about controlling crawl using nofollow attribute on links. Example: Imagine a situation where an ecomm site creates duplicate pages due to faceted nav, and we don’t want those dupe pages wasting crawl budget… so imagine there’s a huge number of dupes and for sake or argument, can’t be fixed at the root cause so we’re left working with rel canonical etc., robots.txt file, robots meta tags and nofollow attribute on links – so if we don’t want Googlebot to even bother crawling those dupe URLs in the first place (improve crawl budget) then what I want to know is, is using the nofollow attribute on links to those dupe pages going to successfully improve the crawl budget?-i.e., will Googlebot literally not follow those links therefore improving crawl budget? Note that I’m not interested here in page rank sculpting, just controlling crawl. Google’s own doc here https://support.google.com/webmasters/answer/96569?hl=en seems to indicate that you can indeed control crawl budget using nofollow attribute on links. Can you help clarify this question? Yes you can, but don’t forget Google doesn’t follow a path as it crawls your site, as Gary said in the video, so it isn’t a “sure thing” solution. Any reason to not canonicalize dupes? My understanding is applying “no-follow” doesn’t mean Google won’t crawl those URLs. Can someone please confirm this ? Also I wonder would not robots.txt be an ideal solution to control this ?